New York is the second largest wine producer in the United States, and more New York wine is made here in the Finger Lakes than in any other part of the state. 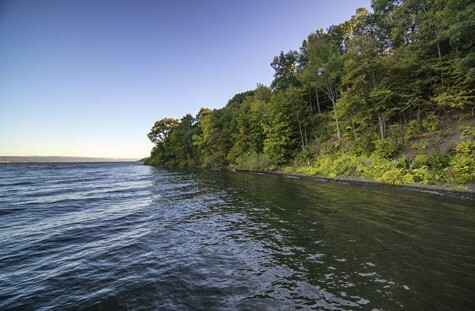 The Finger Lakes region is so named because of the long, narrow lakes that lie parallel across the area, north to south. Maguire Family Vineyards sits directly in the center of the region on the eastern shore of Seneca Lake, the deepest of the Finger Lakes and the one with the highest concentration of wineries and vineyards. Great wine starts from the ground up. Thanks to the earth-moving effects of the same glaciers that originally created the lakes millions of years ago, this region enjoys a wide variety of soil compositions in a relatively small area. Grapes take on characteristics of the soil and climate in which they grow, and those subtle nuances are subsequently transferred to the wine. As a result, the flavor profiles of wines made in the region can often vary significantly, even from lake to lake. Riesling, in particular, is recognized as a varietal which exemplifies the character of its region to a great degree. That’s why our region is known for producing exceptional Riesling and Cabernet Franc wines, as well as a wide variety of cool-climate and native varietals. Maguire Family Vineyards is proud to offer many of these grapes, including both Riesling and Cabernet Franc. There’s a reason that the Finger Lakes are home to over one hundred wineries: this is one of the best cool-climate wine regions in the world. Between the multitude of soil compositions and the temperature-moderating effects of the long, narrow lakes that define the landscape, the Finger Lakes offers a host of unique characteristics that are ideal for growing outstanding grapes, the most important part of truly great wines.